For WZIS student station manager Corey Clark, coming to Indiana State University and joining Student Media was an easy decision. According to Clark, a communication major, he chose IIndiana State over schools such as Ball State because of the radio program. During his senior year of high school, Kurt Darling, an State student, gave him a tour of campus and introduced him to the radio station and the professional station manager Rich Green. "What I liked about Indiana State is that you get on air right away, which is great for your experience," Clark said. Clark came into college with radio experience. 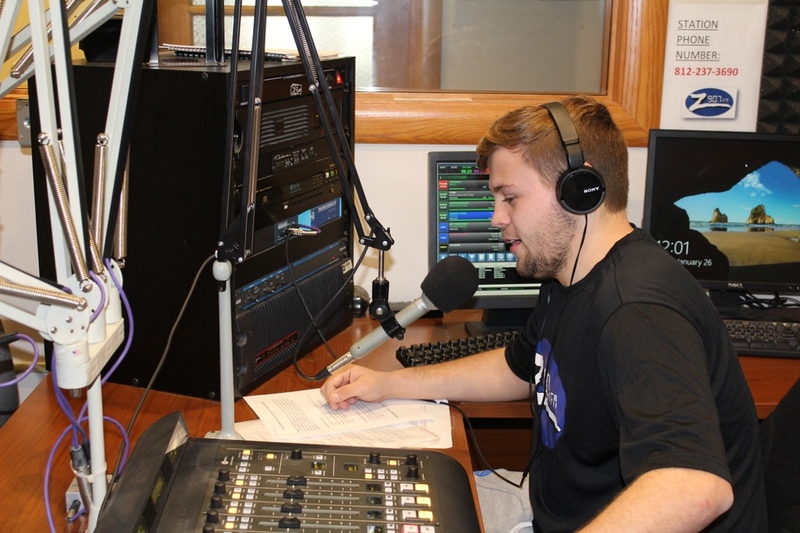 During his junior and senior year at Danville Community High School, he traveled to Ben Davis High School to spend half of his day working with their radio program. "Corey has grown a lot since he started working here," Green said. "He came in with some experience as a freshman, so he was already pretty polished, but he took the opportunity to really learn some new skills when he got her. He's always been a go getter since day one." Clark became the student station manager his junior year, and he has been involved with other forms of Student Media, including the Indiana State Sports Network. He has experience with being a DJ and lots of broadcasting experience. "He has learned how to help people get better at stuff," Green said. "He's turned into a leader, and he helps other students in different areas, whether it's on-air work or behind the scenes. He's definitely like the station's biggest cheerleader." Clark has been nominated and won many awards. He was nominated for Best Student Station Manager for Radio from the Intercollegiate Broadcasting System, and he has won Best Sports Pre/Post Game Show from the same organization. He currently does sports broadcasting for DLC Media in Brazil, Ind., but he wants to eventually move out of state to work. "Corey has a bright future in broadcasting," Dave Crooks, owner of DLC Media said. "He likely wants to focus on sports broadcasting, however, he has the right skills to be versatile. A multi-task broadcaster is in demand in small- and medium-size markets. His ability to do sports and possible sales and promotions should help him open many doors." Clark says the experience he has received from being a part of Student Media has helped him prepare for work outside of college, and he would encourage others interested in media to get involved as much as they can.